She also addressed claims of interference in the AFN national chief vote. Minister of Crown-Indigenous Relations Carolyn Bennett addresses the Assembly of First Nations annual general assembly in Vancouver on July 26, 2018. VANCOUVER — The federal government must "get out of the way" of First Nations in their efforts to bring about self-determination by ditching failed colonial policies and working with Aboriginal leaders to address issues such as justice, health, racism and child welfare, Crown-Indigenous Relations Minister Carolyn Bennett says. She told the annual Assembly of First Nations gathering Thursday that Canada needs a mechanism to protect their rights and title to end the practice of court battles and protect inherent and treaty rights. The government is working toward a framework that is expected to be in place before the next election in 2019, Bennett said, adding the "code of conduct" for Canada would ensure it follows the recommendations of the Truth and Reconciliation Commission, the United Nations Declaration on the Rights of Indigenous Peoples and the demands of generations of Aboriginal leaders. Canada itself has been the greatest barrier to progress on self-determination and now needs the help of Indigenous leaders to "reorient" itself in a new direction, she said. "How do we, as Canada, make sure that we are held accountable for the agreements we have signed and for our honour of the Crown in upholding the inherent and treaty rights which are yours from time immemorial?" Bennett said. The chiefs from across the country re-elected National Chief Perry Bellegarde to a second term on Wednesday. Bellegarde and his four challengers said in speeches before the election that the status quo based on a colonial approach cannot continue, and Bennett acknowledged their concerns in her own speech, saying it's time for change that ensures First Nations can't be taken backwards by future governments. "We have to move from what was an approach of Canada, of a denial of rights, where you had to claim your rights and go to court to prove your rights, into a recognition of your rights straight off," she said. Recognizing the implementation of Indigenous rights should inspire all Canadians and stand as a badge of honour, she said, adding it should be as important as medicare and the charter. The minister also addressed claims raised Wednesday by some of the leadership candidates of election interference because she attended the assembly before the vote and met with an Alberta chief. 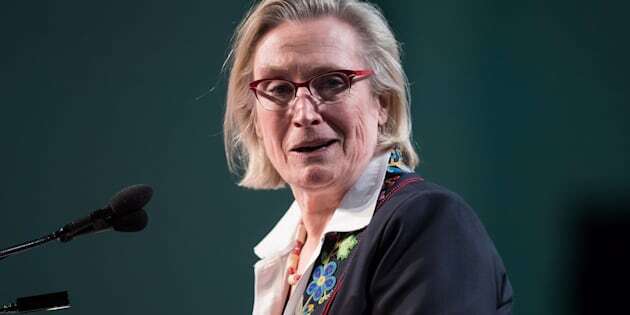 "I have to say I certainly had no intention of upsetting people by accepting an invitation of a newly elected regional chief to hear from the chiefs in her region about their urgent concerns," Bennett said, referring to Chief Marlene Poitras. "I have far too much respect for all of you to ever try to influence your decisions." Before speaking to the assembly, Bennett told reporters the government is working to address child and family services, which she called a humanitarian crisis. "We are trying to make that significant change from money going to lawyers to apprehend children, agencies that get more money the more children they apprehend," she said, adding issues of non-Indigenous foster families are also being considered. The families of two First Nations men who were killed in separate incidents in recent years also addressed the chiefs at the gathering, pleading for action after acquittals in both cases. Jon Styres, a 29-year-old man from Six Nations in Ontario, was shot in February 2014 after he broke into a truck at night. Peter Khill admitted he killed Styres, but pleaded not guilty to second-degree murder, saying he fired in self-defence when he thought Styres was pointing a gun at him. A jury found him not guilty in June, but the Crown announced last week that it is appealing the acquittal. Debbie Baptiste cried and held a photo of her son Colten Boushie, who was fatally shot in August 2016 on a rural property near Biggar, Sask. She told chiefs not to let his death be forgotten. "I don't want a whole bunch of families lined up behind me telling the same story," she said. "That was my son, that was my baby," she said to chiefs who responded with a standing ovation.